I posted a recipe for honey and apricot flapjack the other day, but mentioned that I don't eat them as I can't digest oats. I have been playing around with my own recipes for gluten free bars but I haven't been really satisfied with anything I had made until now! 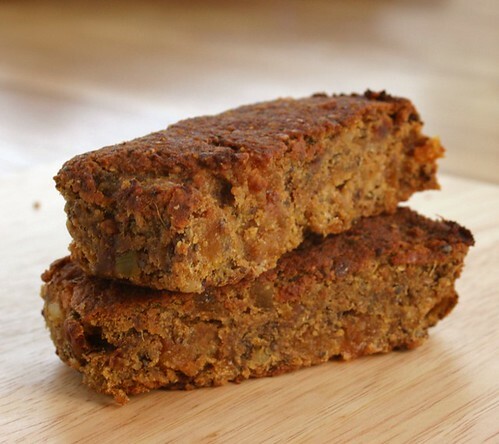 As a bar goes, these are light, cake-y in texture yet really filling and so very useful as snacks during the day, or to put in lunchboxes. They are naturally gluten free and sugar free as well as containing no added fat and really high protein levels which will also make them good for pre- or post gym snacks. They are vegan as long as you use pea or soy protein isolate. You can find pea protein isolate from Pulsin' in the UK here with superfast delivery, alternatively stores like Holland & Barrett in the UK should stock it. In the states you buy a non-GMO version here (I haven't ever bought from this company so I can't recommend them). To some people's tastes these will not be sweet enough without adding some sweetener. I didn't but it's up to you. One 45g bar contains 139kcal without using any sweetener in the recipe, that statistic might persuade you to omit it! Did I mention how filling they are? I ate one for breakfast 4 hours ago and I am still not at all hungry and even better, there is no sugar high or low as this contains protein and slow release carbs instead of sugar. This recipe is a useful one for people who can't eat xanthan gum. You can make these using ready-ground seeds and nuts if you have them which will save you time. I haven't found any sources of freshly ground seeds, so as seed flours turn rancid quickly I still grind my own. I have found that buying a coffee grinder has soon paid for itself as seed flour is so much more expensive than raw seeds. Even if you are grinding your own seeds these are still quick to make and you can have these in the oven inside 15 minutes. The bars will freeze fine and can be popped into a lunch box straight from the freezer. Not only will they defrost by lunchtime, the chill will keep the rest of your lunch cool! To store: wrap and store in fridge or freezer (since they are unsweetened they will grow mould if left in a warm environment). If storing in fridge eat within 7 days. For frozen bars, wrap well & eat within 3 months. This is the kind recipe you can play about with, using different combination of fruits or whey or soy protein instead. I have even used some of the flavoured shakes which have the same effect (i didn't like the sweeteners though). The small bowl of a processor would be fine, but lots of health food shops sell ready ground seeds which you can store frozen once opened. My freezer has been too full for this, that is why I grind my own. How about date syrup - are you able to eat that?